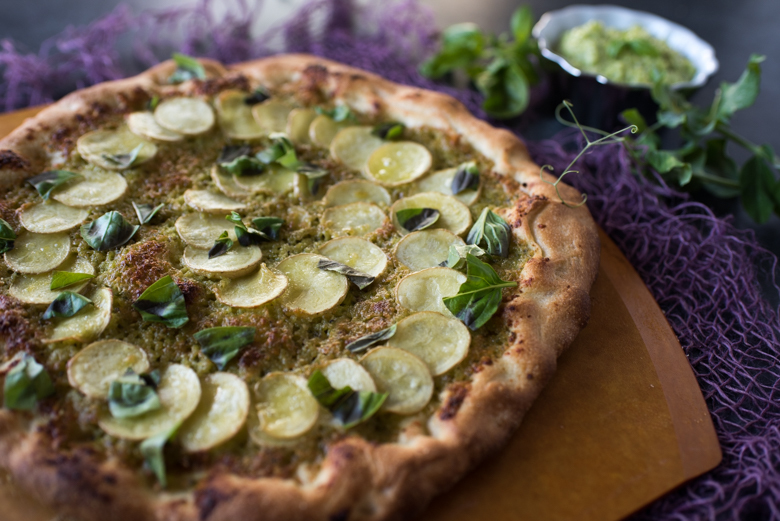 Pea Pesto Pizza! 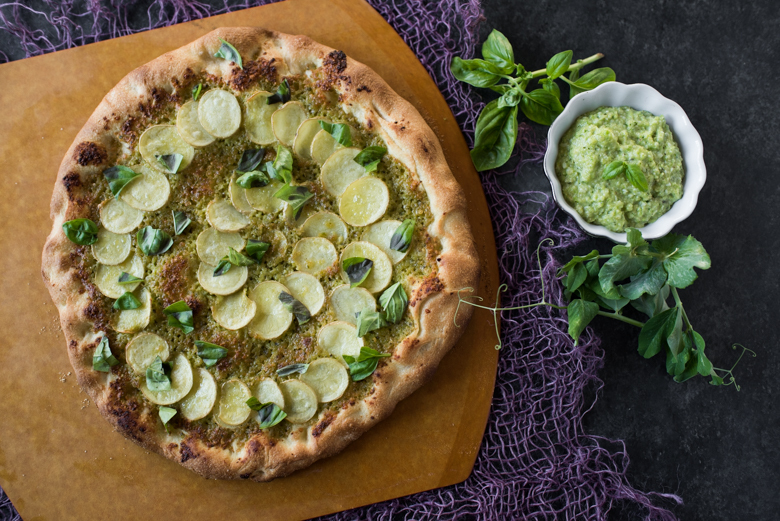 The Pea Pesto is the Star For Your Next Pizza! The Hubbs and I are novice gardeners. We’ve made meager efforts in the past to get some things growing here and there in our backyard along with potted things, but we made the move last year to get a bit more serious about it. We had some land on the side of our house that was wasting away into oblivion, so we got to work! First we decided that we wanted 4-5 garden beds, figured out where we wanted to put them, and started digging sprinkler trenches. Once they were done, we built some garden beds with 12′ x 2′ planks, and filled them with a mix of garden soil from our local garden shop and Happy Frog garden soil. 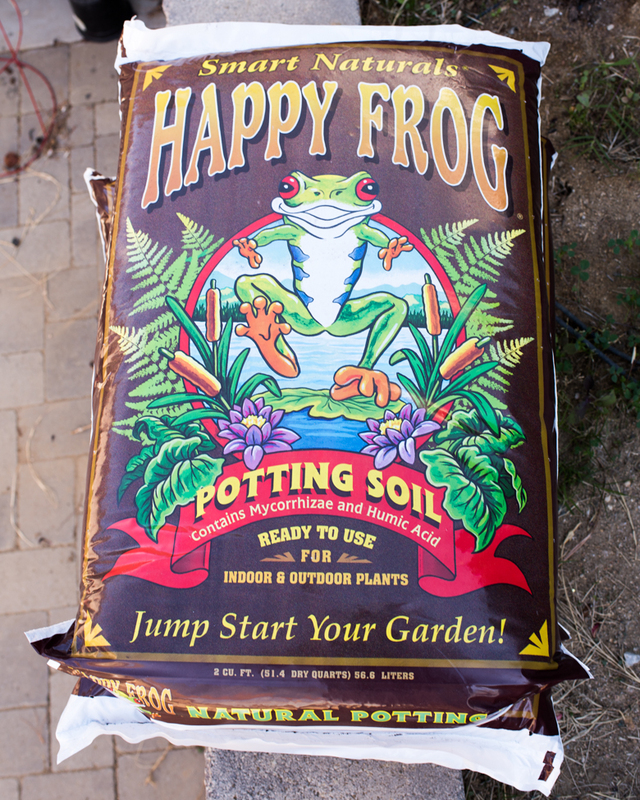 We love the Happy Frog, because it was amended with fertilizer already. It was a bit of work, but we took the project in chunks, and now we are reaping the rewards! 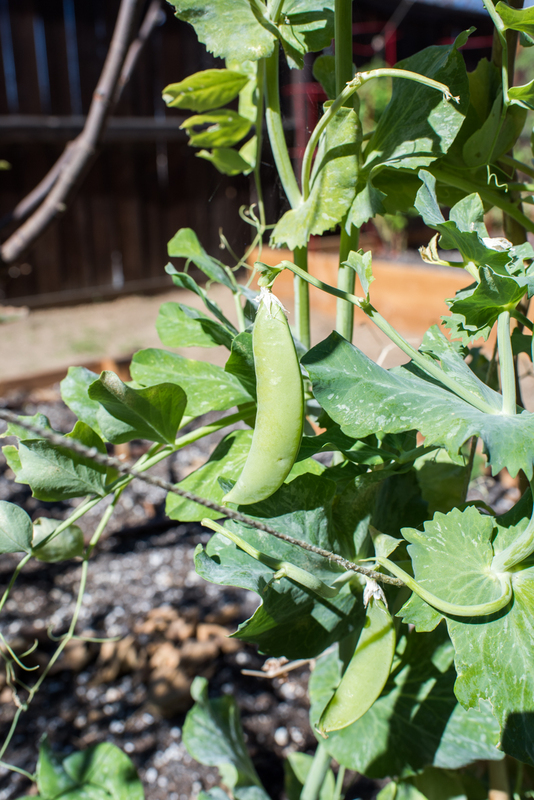 We start seedlings, and plant what we want, which is how we got these garden peas! I had some old pea seeds laying around, and the Hubbs was interested in them, so he put them in the soil, along our drip line, and a month and a half later, we have this wonderful pea bounty! Sure, we could have just eaten the peas. They were crisp, fresh, and simply fantastic! But sometimes, you just want pizza, and I wanted to marry the two. When I think of pesto, however, my mind goes right to herbs, but not this time! I had just gotten the book Kitchen Creativity by Karen Page & Andrew Dornenburg during a Melissa’s Produce presentation, and the mind started cranking. Peas are green, you can eat them raw if you like, and why wouldn’t they work in a pesto?! After all, carrot tops work well too! Well, the end result was nothing short of amazing. 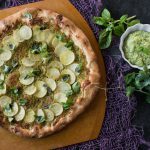 Full of fat from the pine-nuts, and nutrient rich nutritional yeast bumps up the cheesy flavor in the place of the traditional Parmesan cheese. The basil and lemon juice add a lovely depth of flavor too. This makes a bunch, so you can probably make a couple pizzas with this! We ended up using it as a sandwich spread, and dipped veggie sticks into it as well. So yummy! Now, go make this pizza, and let me know how you get on! Tag me on Instagram (@DvlWearsParsley, #dvlwearsparsley), and I’ll show you some love! 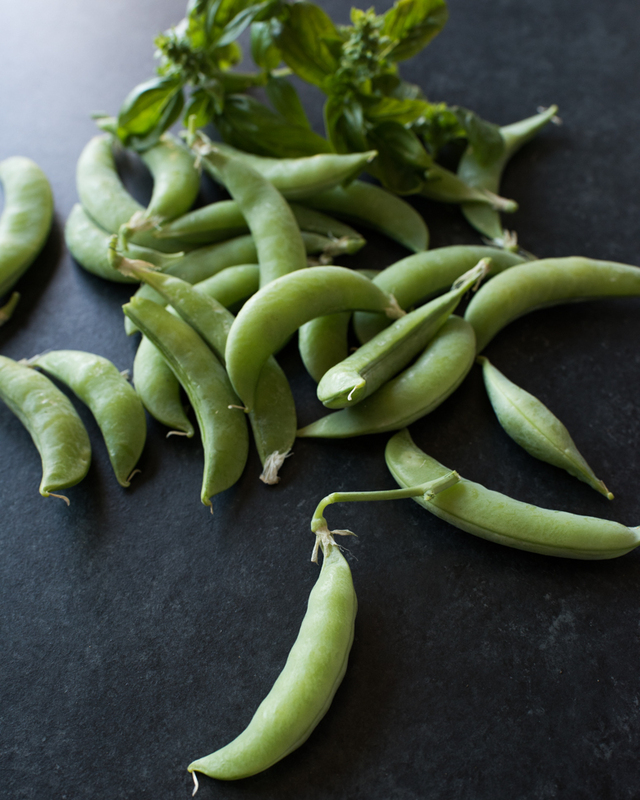 Place the sugar snap peas, pine nuts, basil, nutritional yeast, lemon juice, salt, and pepper in a food processor fitted with the S blade, and pulse a few times until very roughly incorporated. Turn the food processor on continuously, and slowly add in all of the olive oil. 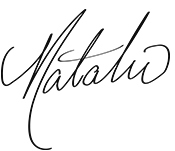 Let process until fine chunks remain. Remove to a container with a plastic lid, and set aside while you assemble your pizza. 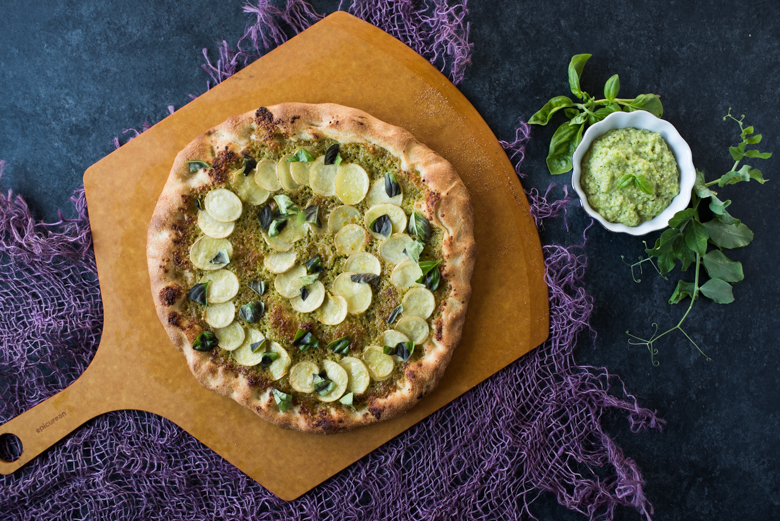 Either on a pizza peel (as long as you have a pizza stone), or a cookie sheet, arrange your pizza dough in a large circle, brushing the outer edge with olive oil. 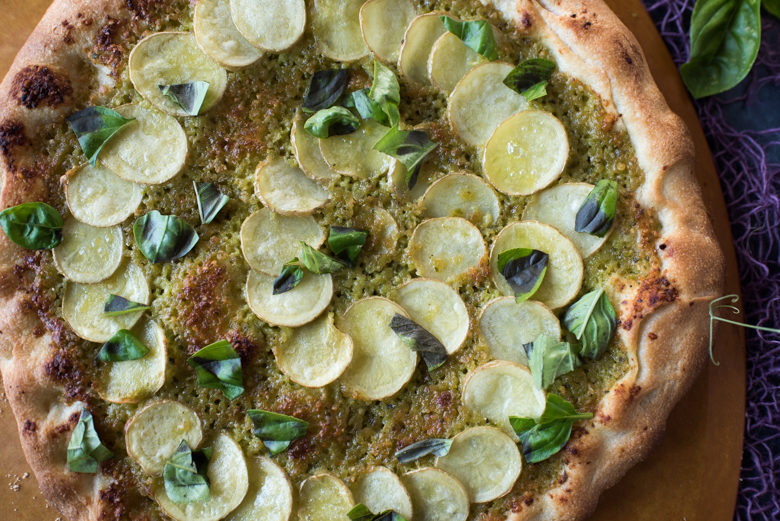 Spread a thin layer of pesto over the whole pizza, and top liberally with the potato slices. 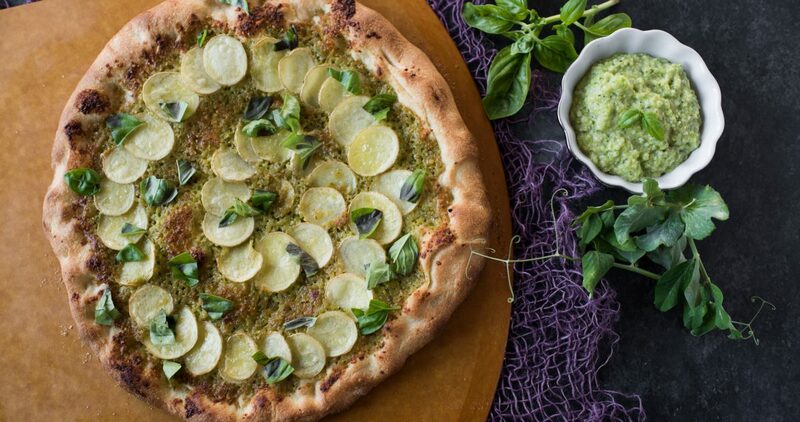 Spray the pizza with a thin layer of olive oil, so the potatoes crisp up, and put in the oven for 10-12 minutes, or until the edges of the pizza are golden brown and the potatoes are cooked, and bubbling. Remove from the oven, and allow to cool for 1-2 minutes, then top with more torn basil, and serve! *DISCLAIMER This post contains affiliate links. I was given the book Kitchen Creativity by Melissa’s Produce, but was not compensated in any other way. All opinions are my own.